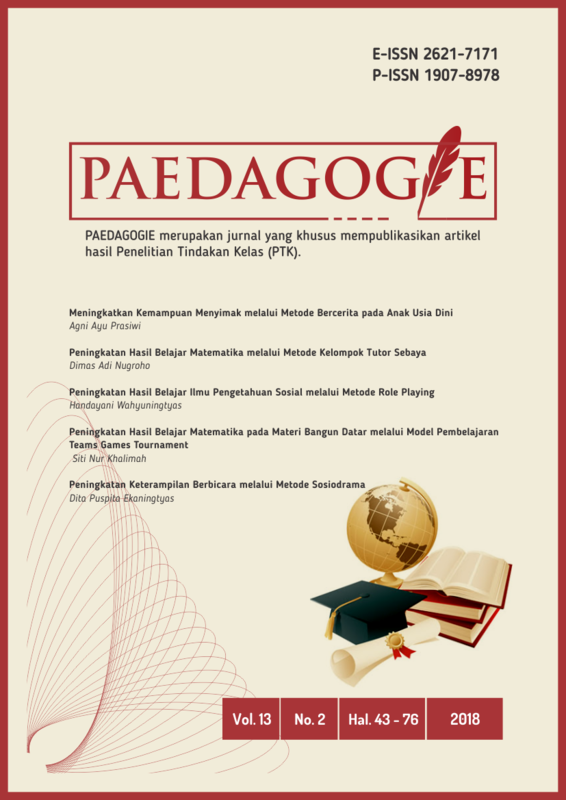 This study aims to foster learning motivation so that it will improve student learning outcomes in the subject of social science through the Role Playing method for Grade V Students Primary School Jenar Kidul, Purwodadi, Purworejo. This research is a calssroom action research with a cycle model that is carried out repeatedly and continuously. The subject of this study was the grade V students totaling 14 students and the object was social studies learning. Data collection methods are carried out through observation and test. Data analysis techniques used quantitative descriptive analysis. The result of the study indicate an increase in the result of learning social science. An increase in learning outcomes can be seen from the increase in student motivation which affects student learning completeness from the average score in the students initial data which is 59.64 and has a learning completeness of 57.14% and at the end of the first cycle the average score of students becomes 68.21 with the completeness of learning being 74.00% and at the end of the second cycle the average value of the students rose to 80 with 95% of students learning completeness. Aside from increasing learning outcomes, the activeness of students in the learning process in the classroom also experienced an increase.